Short-pulse laser irradiation creates better layer adhesion. Efficient energy storage devices are in constantly growing demand. Lithium-ion batteries in particular are of key significance to progress in electro-mobility and to the stationary storage of energy. Therefore, one of the aims of research is to enhance the capacity of accumulators. Usually, the electrodes of lithium-ion batteries consist of a current conductor and the substances involved in the reaction, the active matter. The cathode normally incorporates an aluminium foil as a current conductor, while the anode has a copper foil for this purpose. Layers of graphite can be used as active matter for the anode. The efficiency of a battery depends on a sufficient mechanical and electrical link between the active particles and the current collector. Insufficient bonding can result in the layers becoming detached and in battery failure. KIT researchers at the Institute for Applied Materials (IAM) have now developed a method to optimise the surface structures of the current conductor foils for bonding with the active matter. 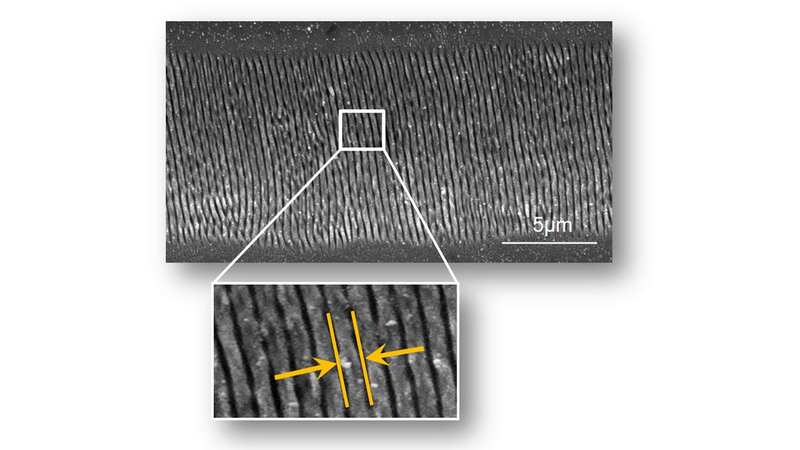 With the aid of short-impulse laser irradiation, nanostructures are created on the surfaces. The modified structure significantly enhances layer adhesion, and the active matter is firmly bonded with the current conductor. In addition, thanks to there being no need for mechanical or chemical roughening of the surface, thinner foils can be used, which means that the battery will then contain less inactive matter. The advantages are that battery performance is significantly raised by increased energy density, and that it will have a longer life since electrical resistance and the danger of layers becoming detached are clearly reduced.